I have been obsessive about Jane Austen’s works for some time. If you know me well, you are likely to know this. Though I have neglected to invite people to attend, I have prepared a party, of sorts, in her honor. Upon hearing my plan, my daughter offered the loan of her stately, white Christmas tree. 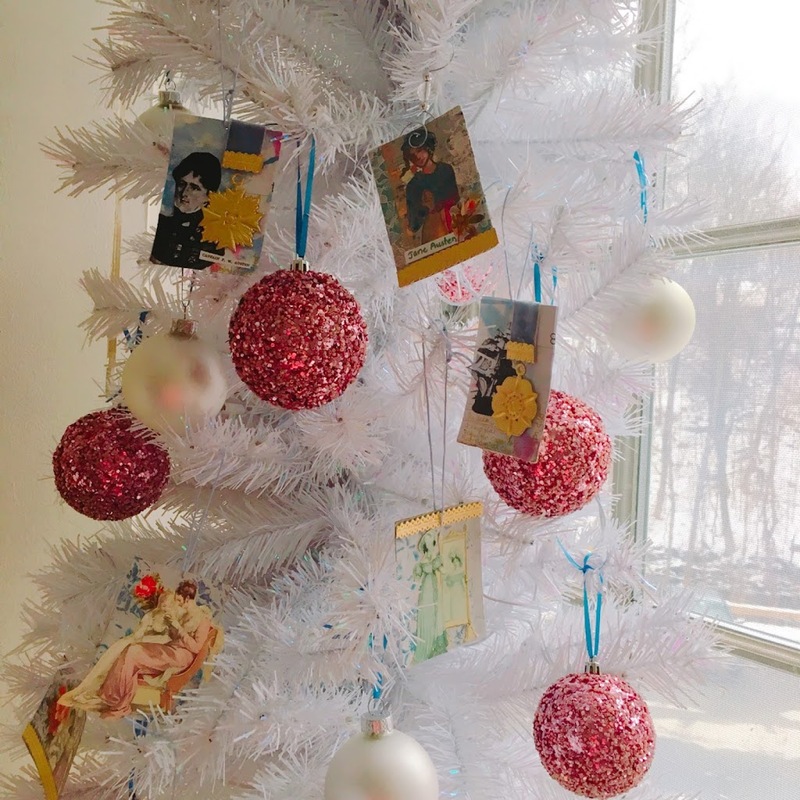 Soon it was decided that ornaments reflecting the world of Jane Austen would be the focus of this celebration. One would think to start by creating a list, or making some notes, but that is not how the ornaments were developed. Sorting through some materials I have gathered through the years (also read hoarded with the thoughts of clutching them in my hands until my last breath) I found some images that would give me the jump start for these ornaments. 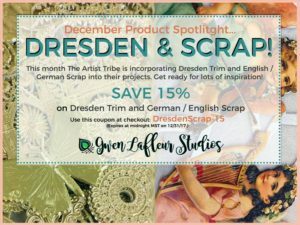 Other influences were reference books I have acquired over the years and a wonderful stash of Dresden Trim from Gwen Lafleur’s shop. 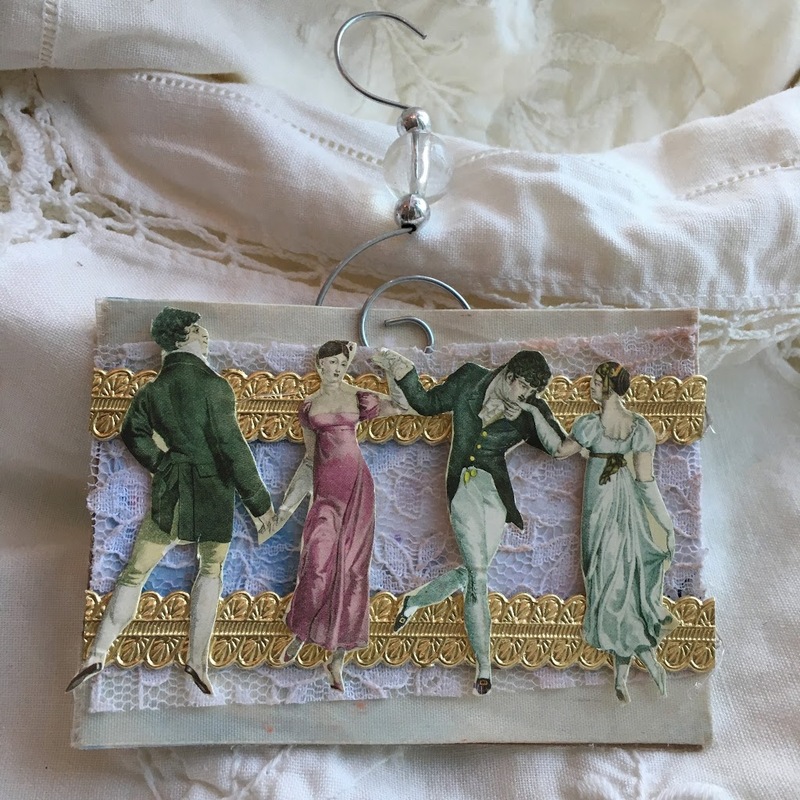 Just see how these elements come together to celebrate the genius of Jane Austen. Note: Much discussion has been had by those of use who love Jane Austen (also referred to as Janeites) regarding how to refer to the lady. Referring to that most talented lady by her given name seems crass and presumptuous and saying Miss Austen seems stilted. If it seems repetitive or silly to type her name out in full, consider the delicacy required of such introductions. I am sure you will forgive me. Jane Austen, the master of the folly of human nature painted portraits of a country village and it’s foibles with a light and humorous touch. The ATC was covered with blue paper, musical scrap, and lace scraps. The portrait of Jane was drawn on and embellished with gel pen. A rose of English scrap was added. Dresden Trim was added with hot glue. 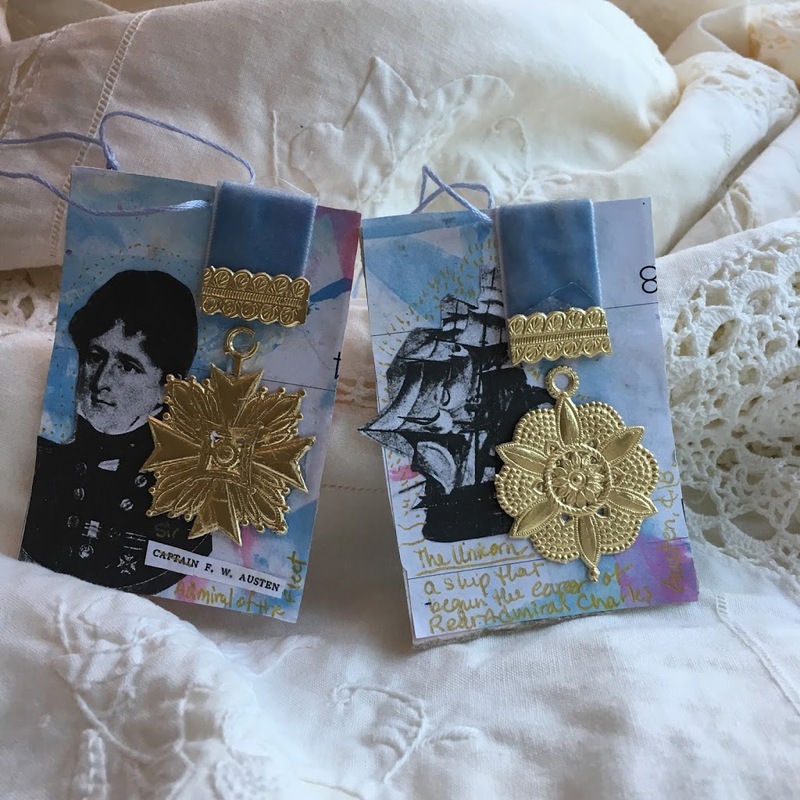 Looking upon the Dresden trim I had received from Gwen’s shop this month it was remarkable how much the pieces looked like the medals seen in the paintings of the two brothers. Each of them wore two medals, one cross-shaped and the other circular. Examining the paintings as much as possible I noticed the way they were hung from ribbons. A velvet ribbon just the shade of blue that had been chosen for this project appeared, seemingly from nowhere. I do not remember ever seeing this ribbon, but there it was on the floor. So it was chosen (though strictly not the correct color for the medal.) Another type of Dresden trim was secured along the bottom edge of the ribbon to echo the look of the metal that held it all together. With these elements in hand and a strong vision for what the ornament should reflect, the search for the background paper begun. 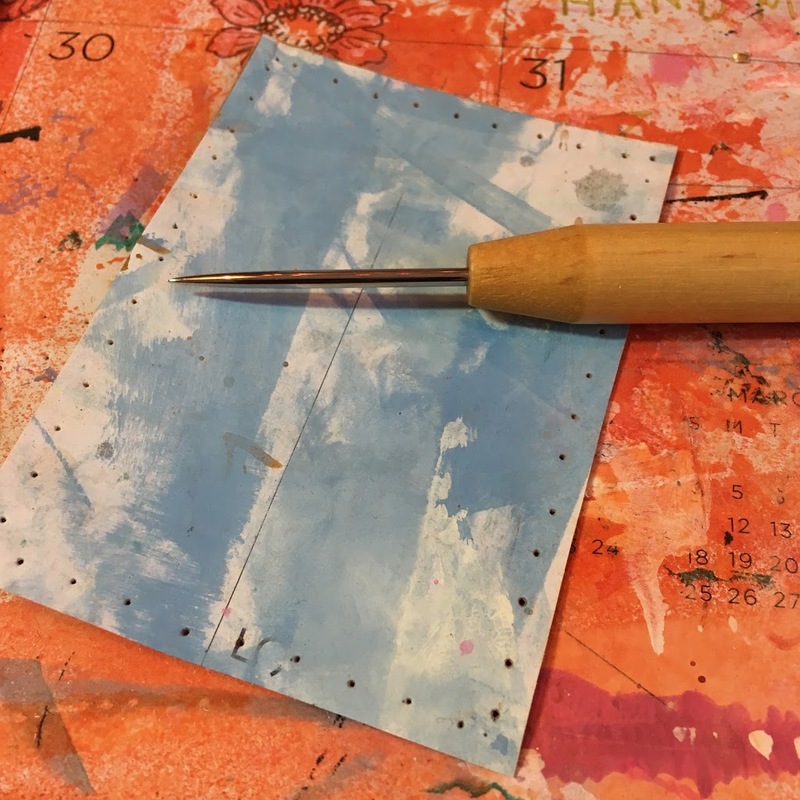 A blotter paper covered with paint the perfect match of blue was found and cut to pieces the size of the ornaments (ATC size – 2.5 X 3.5 inches) and adhered to the ATC backing, in this case, the cardboard packaging from a flat of soda. 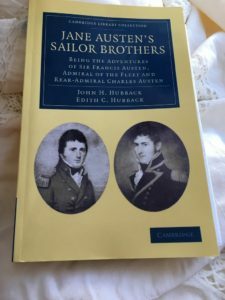 The portrait of Sir Francis Austen and the painting of the Unicorn were both photocopied from the book Jane Austen’s Sailor Brothers: Being the Adventures of Sir Francis Austen, Admiral of the Fleet and Rear-Admiral Charles Austen by John H. Hubback and Edith C. Hubback. trimmed and pasted to the ATCs. Hot glue was used for attaching the Dresden trim and the ribbon. Much of what we know about Jane Austen comes from the letters she wrote to her sister, Cassandra. There is much to be said about her, but that is for another time. 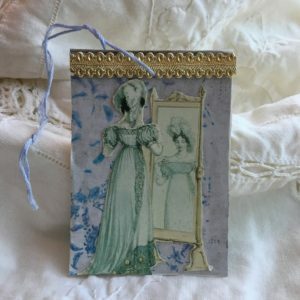 This Casandra ornament is dressed for a ball, looking toward her sister for approval and to make sure that the younger sister does not make a misstep while out in society. 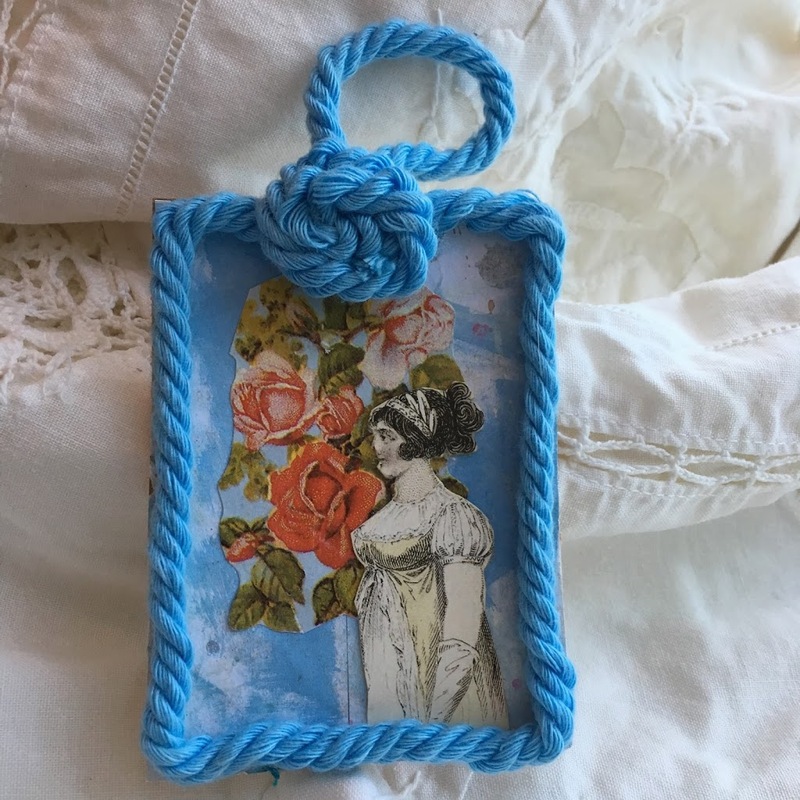 For Casandra’s ornament, I wanted to add this beautiful blue cording I had in my stash. To secure it to the tag one might have used hot glue. Well, one might have if one had thought of it. My mind turned towards needle and thread. First, a ruler was consulted to make .5 inch marks around the ornament. An awl was employed to pierce the cardboard. Then, using a needle and thread, the cording was sewn down. The first attempt was dismal. The stitches pulled at the cording making it unpleasant to see. So, the stitches were taken in the back of the cording in order to preserve the texture of the cord. Ah, but I am getting ahead of myself. First the background was attached to the ATC, English scrap and an image from the card set (see below) adhered with gel medium. The cord was looped around the top into a rosette and secured by sewing it with the needle and thread. There is always a ball, isn’t there? If not a ball, an assembly. This is the chief thrill of the young folk in Jane Austen’s novels. Seriously. That and talking walks. Maybe carriage rides. To make this ornament the card was first prepared by adhering the background paper with gel medium. A white ribbon was added to upper and lower edge. A piece of lace was added but only glued down in the middle to let the edge ruffle a bit. The Dresden Trim was added hot glue. Finally, the dancers were cut from the card and attached with points of hot glue only at the heads. This allows for some movement and depth. Both qualities one wishes for from a dance partner, but are very seldom gratified to find. This image from the card set immediately brought Mr. Bingley’s sisters to mind. It would be just like Caroline Bingley to turn her back to us. The blue background of this piece is made with Gwen’s stencil (see below) attached to the ATC. 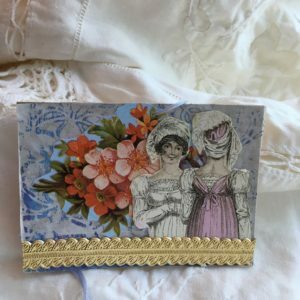 Layer and English scrap flower bouquet and add the figures cut from the Jane Austen cards. Finish by affixing Dresden Trim with hot glue. Mrs. Hurst has the reputation of having 6 inches of lace at her hem, perhaps a double row of trim is called for. Marrianne Dashwood had reason to dress with care. She hopes to continue her association with that rascal Willoughby. Gwen’s stencil again is the background for this ornament. Add the piece from the card, the Dresden Trim and a piece of light blue floss to hang it by. Done almost as quickly as Marianne’s enjoyment of her stay in London. Emma Woodhouse sharing confidences with her protege, Harriett. Would that she would have held back a little in her encouragement of Harriet’s ambitions. 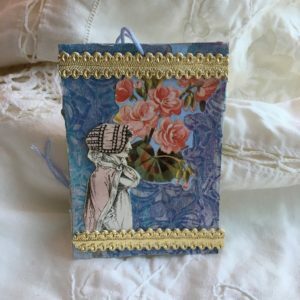 Add paper covered with Gwen’s stencil to the ATC, a small flower of English scrap and the gossiping girls. The ornament is simple but reminds of the complexities of human folly. Anne Elliot, mild-mannered and restrained, is not of the same mold as her extravagant father. She is of a deeper nature. 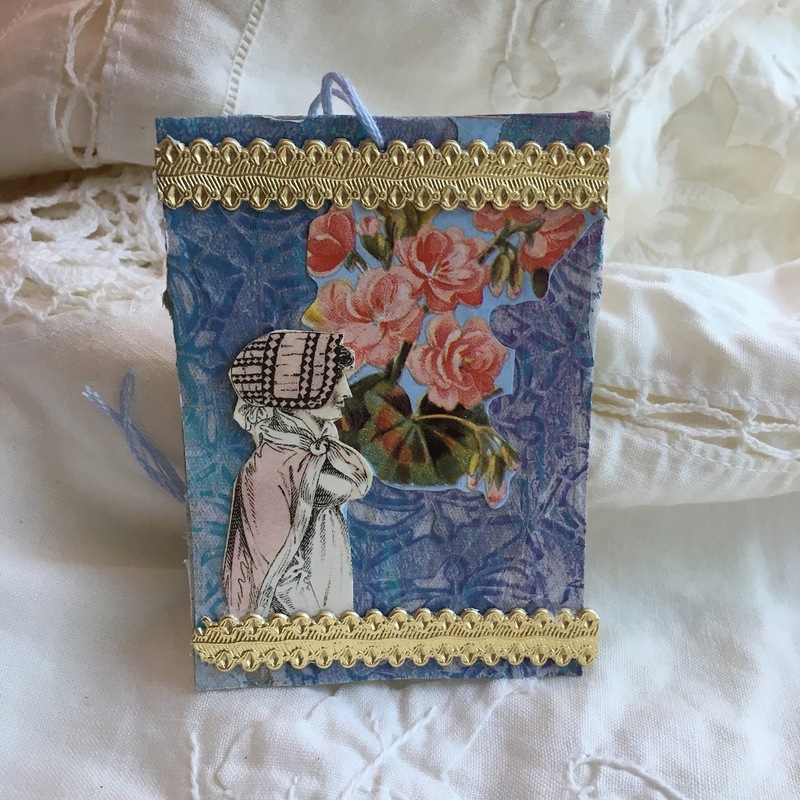 Gwen’s stencil is topped with a piece of geranium scrap from the English scrap, layered with an image from the card set and layered with Dresden Trim above and below. Anne is down to earth like the humble geranium but has the worth of gold with her depth of understanding. You are in luck. 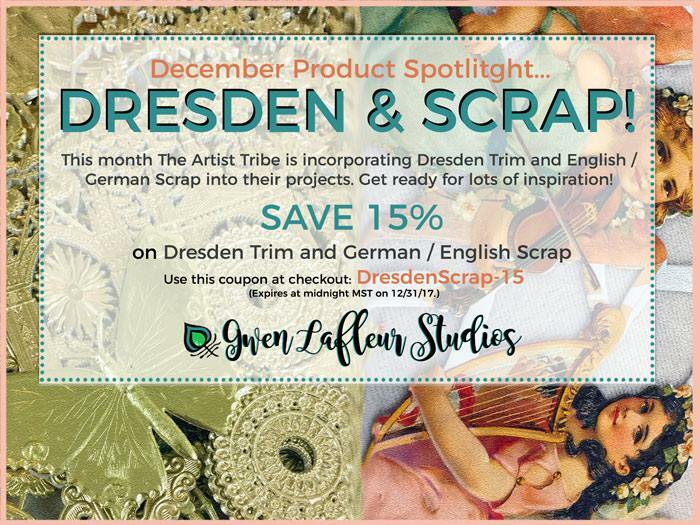 Gwen is having a sale on Dresden and Scrap this month. You won’t regret getting your hands on some of this for the new year. I couldn’t resist putting some things under the tree. Whether they are a gift for Jane Austen or a gift of Jane Austen is up to you. You will see the book I referenced and the set of cards I took the images from. 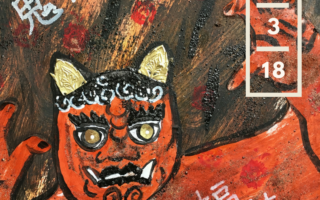 Also, you will see a new product that I am developing for release in the Etsy shop I will open at the beginning of 2018. It is called A Novel Yarn – Art Yarn for the Well Read. This first edition is the Pride and Prejudice Yarn. 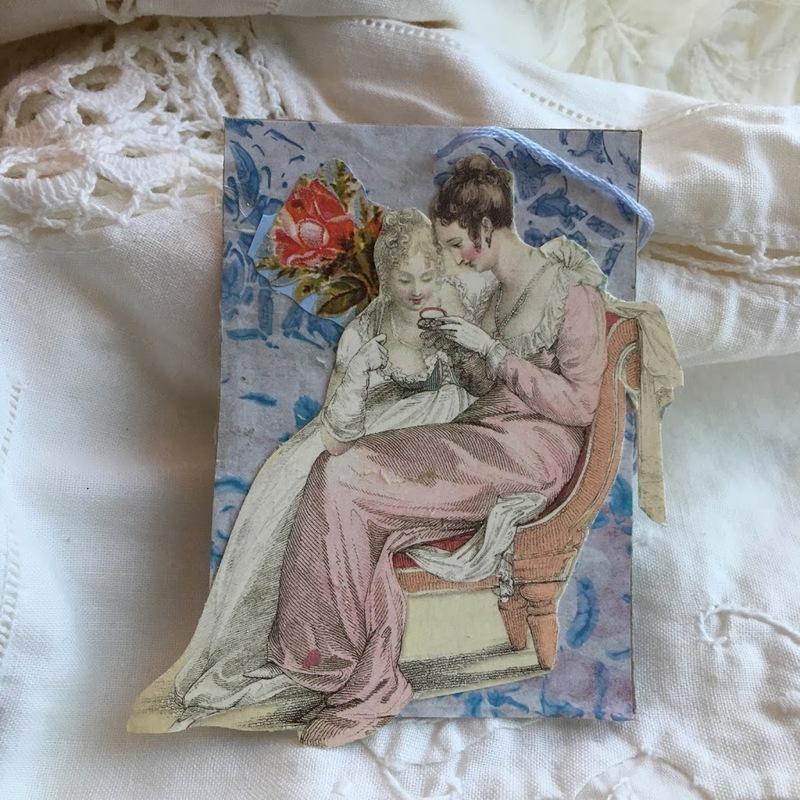 Handspun wool with bits of silk (undoubtedly from the dresses of the Bingley sisters), pieces of lace (what fine young lady neglects lace on her ball gown) and text cut from a used copy of the book. 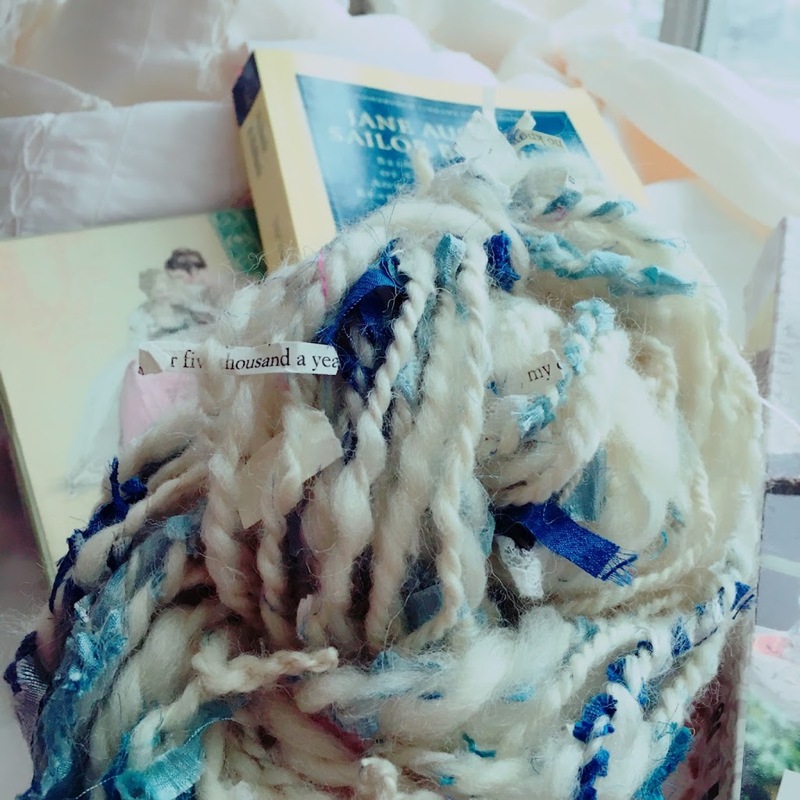 Soft and fluffy, this two-ply yarn is perfect for art projects like weaving and mixed media, but cannot be used for clothing items as it cannot be washed safely. 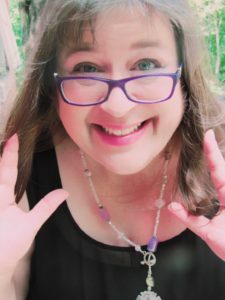 What do you think of A Novel Yarn? What novels/authors would you like to see represented in this line of art yarns? Your thoughts are much valued. Happy Birthday, Jane Austen. You continue to inspire. Jane Austen Notecards. New York, Random House, 2007. How wonderfully creative and beautifully done! This would make a great project for a magazine; I can picture big photos on glossy stock with your narrative. So charming and clever! Thank you so much, Linda! I'm glad you liked it. Hoping at add more ornaments each year. The idea that it could be a magazine project! You have raised my ambitions! Wow Lynda, Jane Austin would be proud indeed! The ornaments are fabulous and the reading back stories is so much fun. All of us hoarders, I mean collectors of indispensable objects, know exactly how you feel. What are the odds of finding just the right piece of ribbon on the floor at that time you needed it. I love the idea of art yarn. Can’t wait to see what you have in your shop! Love your tree and your novel yarn is spectacular! Thank you, Jill! I'm glad you like my little commentary on the characters. I can get going if given much of a chance so what you see here is me practicing restraint. Ah, yes, the indispensable objects! We must not let go of them! And that ribbon! It simply appeared when needed. It felt like I was a character in Harry Potter. I'll keep you posted about the yarn. Thank you, Sandee! It is a new tree idea for me. Glad you like my novel yarn! How fabulous! I love Jane Austen. What a great way to celebrate Jane's birthday. Each one of your ornaments is unique and full of wonderful details. Thanks so much, Kate! I'm glad you stopped by to celebrate Jane Austen's birthday. I sense a kindred spirit. (I like Anne of Green Gables too.) I plan to make more decorations for next year's birthday party. 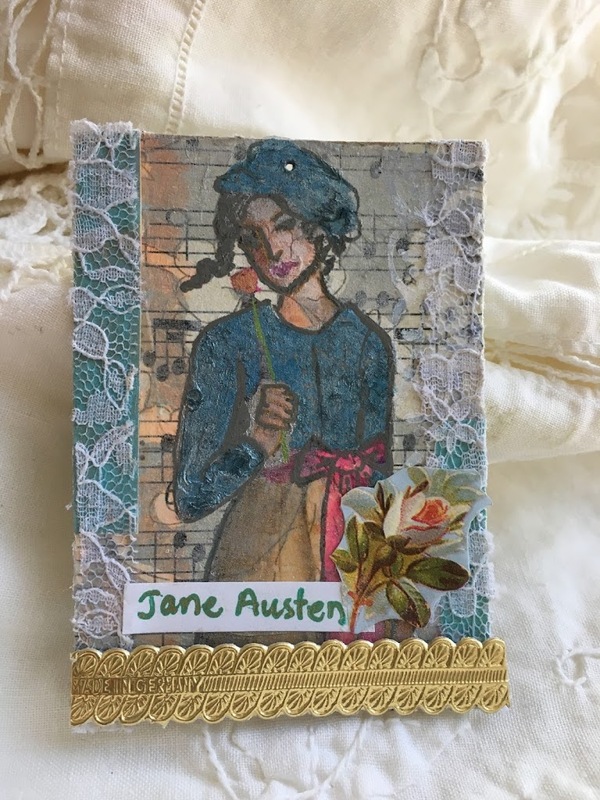 This is so fun Lynda – you really captured the essence of the characters and Jane Austen's family members! Love what you've done here! Thank you, Gwen! I am so fond of the characters (some of whom are her family members!) 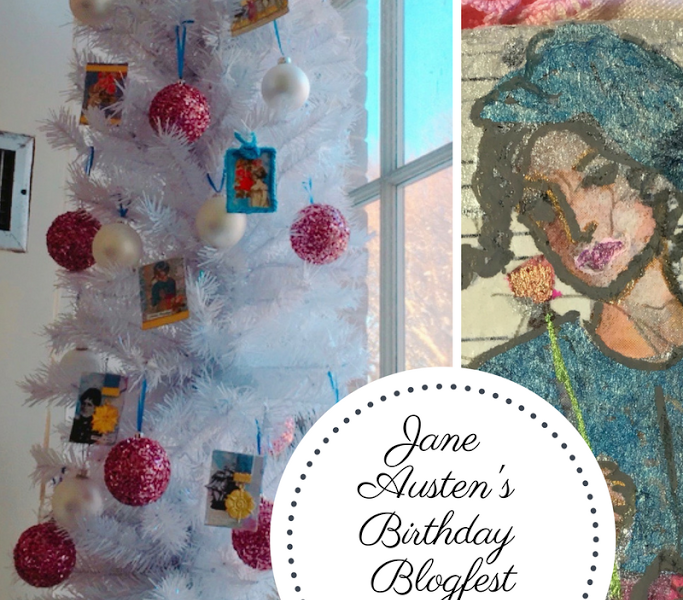 When I saw the Dresden I immediately knew I wanted to add them to Jane Austen's birthday. They are such a great match. Oh Lynda! I would love to attend Jane's party next year should you give another! I adore Jane as well and I ADORE your ornaments! 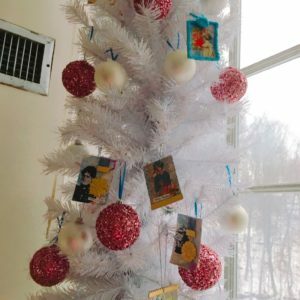 What a lovely tree, festively and so thoughtfully decorated with this specially handmade ornaments-dear Jane would be ever so pleased! 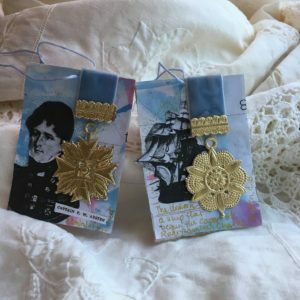 I do love those medallions,yes, just as the brothers did wear- this is just marvelous for sure and now that I know you are so fond of Jane, I will put you in touch with another blog that loves her as well! Very Merry Christmas wishes for you and your family miss Lynda! I look forward to your Novel yarns!Clever indeed,my friend! 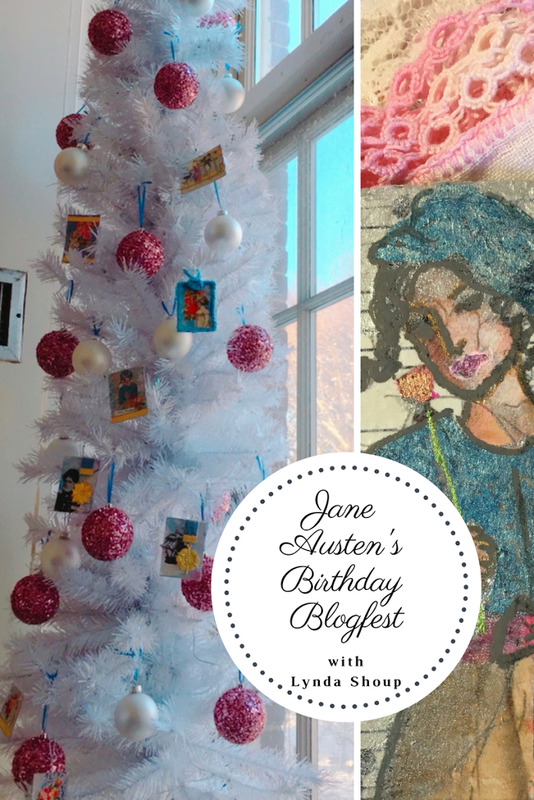 Jackie, I am so glad you enjoyed my Jane Austen tree! Delightful to find that you are also a Jane Austen devotee. Well, I'd say mark your calendar for December 16, 2018 because I believe I will throw another such party. Glad you like the yarn. It is awfully fun to make. Glad you could partake of the festivities. It's on my calendar, I'll be sure to attend! Fantastic! Looking forward to the next one.